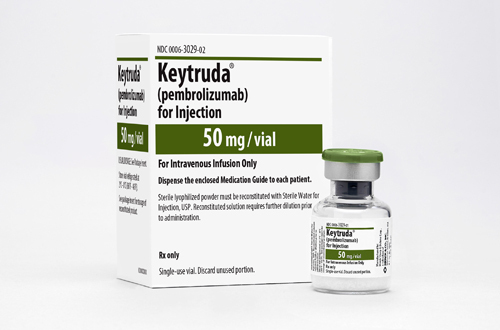 Immunotherapy blockbuster Keytruda has received another boost with the European approval of its use in combination with Lilly’s Alimta plus chemotherapy in non-small cell lung cancer (NSCLC). Marking a first in Europe, Merck Sharp & Dohme (MSD)'s Keytruda can now be used in the three-way combination, becoming the first to be approved as a first-line use for metastatic non-squamous NSCLC patients who don't carry EGFR or ALK positive mutations. The ruling comes just a few weeks after the FDA gave its clearance for the combination. The European Commission (EC) based its decision off data from the KEYNOTE-189 trial, which looked at the treatment in patients who were non-, low and high expressions of the PD-L1 biomarker. Compared to those on Alimta and chemotherapy alone, there was a 51% reduction in risk of death for those treated with Keytruda in combination with Alimta and chemotherapy. The trial achieved its co-primary endpoints, which were overall survival and progression-free survival, the latter of which saw a reduction of 48% in those on the combination. The news comes after its closest rival, Roche's Tecentriq, saw the FDA last week delay its decision on its use in another first line combination. The US regulator says it will take another three months for it to rule on Tecentriq in combination with Avastin, carboplatin and paclitaxel in the same frontline setting for metastatic non-squamous NSCLC patients. While Roche is behind MSD in this group, it may steal a march on its rivals in treating patients with squamous NSCLC. In the UK, lung cancer is the third most common cancer, with around 44,500 diagnoses made annually. The country has the second worst survival rate for lung cancer in Europe, with only 8% of patients surviving more than five years. The newly approved combination will have to go through NICE’s cost-effectiveness evaluation before it reaches UK patients. Louise Houson, Managing Director, MSD UK & Ireland, said: “We look forward to combining our inventive science with the work of healthcare professionals up and down the country so that, together, we can renew our efforts to reach the best possible outcomes for everyone affected by lung cancer."